We may know El Dorado as a mythical city made of gold that tantalised and confounded early European explorers of South America. It in fact translates as ‘the gilded one’ and refers to a rite of the Muisca people, a pre-conquest civilisation that had lands surrounding Bogotá in present-day Colombia. They would toss gold offerings for their gods into Lake Guatavita, and when a new ruler came to power he would symbolically turn himself into an offering by covering his body in gold dust and sailing into the lake. Conquistadors heard tales of this and effectively convinced themselves that, as people had that much gold to spare, they must have made a city out of it. A new exhibition of pre-Colombian artefacts at the British Museum, which runs until March, promises to take us ‘Beyond El Dorado’ – beyond what the term has come to mean, and also into a past long before Europeans imposed their myths upon South America. The older pieces in this exhibition could have been made 3000 years before the conquest. I say could have been. Gold work here can only be dated by recourse to known styles; ceramics, similarly, are given a timespan rather than a precise date, sometimes wider than a millennium, sometimes the known length of a settlement or civilisation. The detail of the items, which belong to the British Museum or Bogotá’s Museo del Oro, can be especially impressive on a tiny scale. Among the exhibits are ornamented dipping pins used to extract lime from flasks. When chewed with lime, coca leaves would release a stimulant and appetite suppressant. The heads of these pins gave the goldsmith a lozenge-sized canvas on which to work and the effects can be stunning. The human figurines the Muisca people threw into the lake as offerings were called tunjos. Recurring throughout the exhibition, these are possibly the most fascinating pieces, their faces executed simply and aggressively in squares and sharp lines; tiny, wiry arms pointing up from their waists; legs squat on a long, narrowing point of metal. They look like they’ve been flung violently at us through history. As you move through the exhibition you realise their significance as signposts. They do what their flesh and blood counterparts would have aspired to: they carry the shrunken heads of enemies, wear ritualistic masks, sport brilliant nose piercings wider than their heads which jangle in response to footsteps around the room. One tunjo can be seen with whiskers, caught midway through an animal transformation. 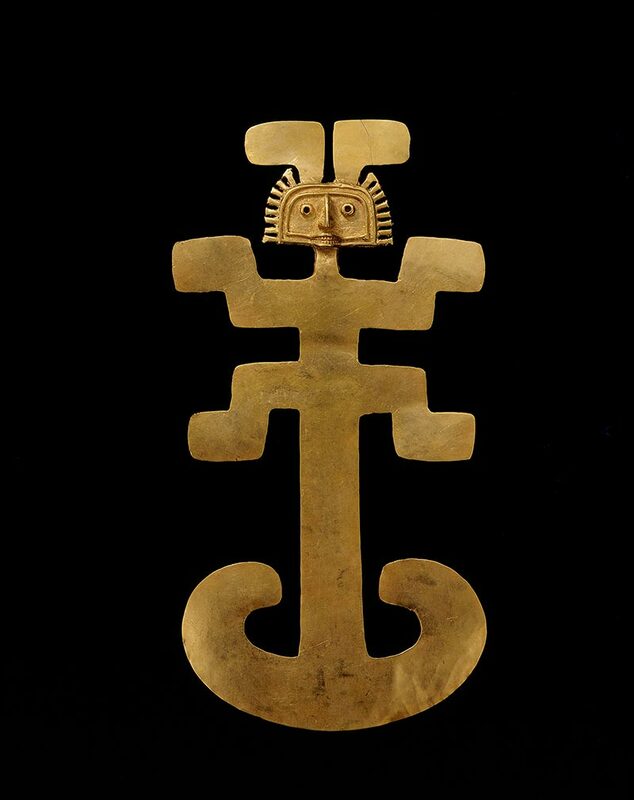 Pectoral, early Tolima (1 BC–700 AD) © Museo del Oro – Banco de la República, Colombia. The exhibition spaces are kept dim to better illuminate the ancient gold. Everything certainly looks precious. This also means people need to press their faces against the glass to study tiny figures or read the occasionally rather vague captions (necklaces of real teeth, as well as gold versions, we are told, were ‘probably’ worn). I came to the exhibition with my girlfriend, who is looking to pursue postgraduate study of Mesoamerica. Anything I say which approaches insight, therefore, comes straight from her. Otherwise, because these artefacts have been rendered partially mute by history, more room is made for your instinctive experience of them. There’s pathos in observing anything by a dead artist. What about a human figure created by someone whose culture has been silenced, its methods lost, but with a pendant left dangling on its nose, still vibrating with misunderstood energy? 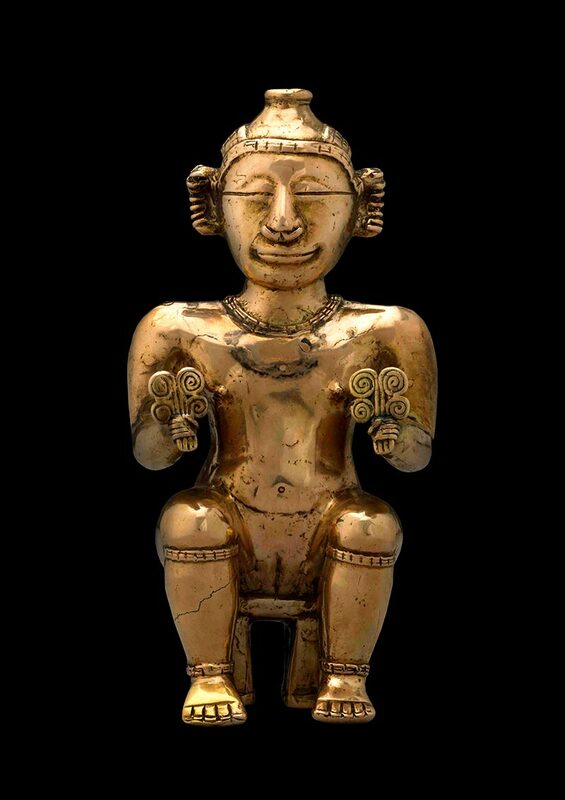 ‘Beyond El Dorado: power and gold in ancient Colombia’ is at the British Museum, London, until 23 March 2013. Royal Museums Greenwich’s acquisition of George Stubbs’ Kangaroo and Dingo paintings is the most significant in their history. What’s next for the works? Is the huge cache of art discovered recently in Cornelius Gurlitt’s Munich flat in safe hands?